The video about backyard pool safety every parent needs to see. 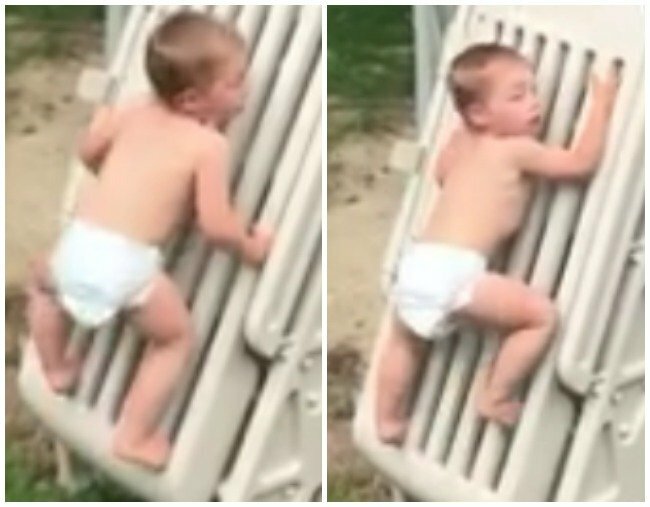 The viral video every parent of a toddler needs to see. Cody Wyman is two years old. Like all toddlers, he doesn’t like staying still. In fact, he’s at a stage where it seems as though he’s biologically wired to climb. Climbing – on stairs and lounges and chairs – is how Cody will build strength, balance and flexibility, and learn about his environment. But on Friday afternoon, as his parents Keith and Tonya watched from just a few feet away, Cody’s penchant for climbing very nearly took a dangerous turn. Keith, who lives in Massachusetts, posted a video of the incident on Facebook, and it has since been viewed over 23 million times. In the clip, Cody smiles at his parents as he starts to climb the ladder into the family’s above ground pool. According to the New York Post, what Cody is climbing is actually meant to be a ‘safety gate’ for the ladder – one that prevents children from being able to get into the pool. “So I’m posting this video after I found my two year old Cody trying to climb our pool ladder when it was closed and locked…” Keith wrote on Facebook. “I just got it with the new pool. With close to 100,000 comments, some viewers of Keith’s video shared their own frightening experiences with backyard pools. Nonetheless, the video is a valuable demonstration of how determined and strong a toddler can be when they want to get somewhere. And how dangerous our backyards can be – even when we think we’ve made the necessary provisions to make them safe.